Below you can view all the homes for sale in the Majestic Oaks subdivision located in Wake Forest North Carolina. 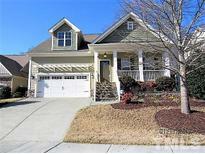 Listings in Majestic Oaks are updated daily from data we receive from the Raleigh multiple listing service. To learn more about any of these homes or to receive custom notifications when a new property is listed for sale in Majestic Oaks, give us a call at 919-230-8729. Open, flowing floor plan showcases double trey ceilings, custom millwork, crown moulding, wainscoting, stone fireplace, chef's kitchen, vaulted ceiling in screened porch, paver patio with fire pit, upgraded light fixtures and full access to Heritage Golf Course amenities MLS#2247436. 5026. ENERGY STAR Certified. ENERGY STAR Appliances. Sealed crawlspace. MLS#2232605. 3061.